1 A None No Power Seat 1 A is a standard Cloud Nine Business Class seat that transforms into a fully-flat bed and is located at a bulkhead. The proximity to the galley and lavatory area might be bothersome. A bassinet might be installed on the bulkhead for use by a passenger traveling with an infant. 1 C None No Power Seat 1 C is a standard Cloud Nine Business Class seat that transforms into a fully-flat bed and is located at a bulkhead. The proximity to the galley and lavatory area might be bothersome. A bassinet might be installed on the bulkhead for use by a passenger traveling with an infant. 1 D None No Power Seat 1 D is a standard Cloud Nine Business Class seat that transforms into a fully-flat bed and is located at a bulkhead. The proximity to the galley and lavatory area might be bothersome. A bassinet might be installed on the bulkhead for use by a passenger traveling with an infant. 1 H None No Power Seat 1 H is a standard Cloud Nine Business Class seat that transforms into a fully-flat bed and is located at a bulkhead. The proximity to the galley and lavatory area might be bothersome. A bassinet might be installed on the bulkhead for use by a passenger traveling with an infant. 1 J None No Power Seat 1 J is a standard Cloud Nine Business Class seat that transforms into a fully-flat bed and is located at a bulkhead. The proximity to the galley and lavatory area might be bothersome. A bassinet might be installed on the bulkhead for use by a passenger traveling with an infant. 1 L None No Power Seat 1 L is a standard Cloud Nine Business Class seat that transforms into a fully-flat bed and is located at a bulkhead. The proximity to the galley and lavatory area might be bothersome. A bassinet might be installed on the bulkhead for use by a passenger traveling with an infant. 11 A None No Power Seat 11 A is a standard Economy Class seat that has extra legroom and is located at a bulkhead. The proximity to the galley and lavatory area might be bothersome. The tray table and inflight entertainment monitor are installed in a fixed armrest, therefore, seat width is slightly reduced. Floor storage for personal effects is not available for use during takeoff and landing. A bassinet might be installed on the bulkhead for use by a passenger traveling with an infant. 11 B None No Power Seat 11 B is a standard Economy Class seat that has extra legroom and is located at a bulkhead. The proximity to the galley and lavatory area might be bothersome. The tray table and inflight entertainment monitor are installed in a fixed armrest, therefore, seat width is slightly reduced. Floor storage for personal effects is not available for use during takeoff and landing. A bassinet might be installed on the bulkhead for use by a passenger traveling with an infant. 11 C None No Power Seat 11 C is a standard Economy Class seat that has extra legroom and is located at a bulkhead. The proximity to the galley and lavatory area might be bothersome. The tray table and inflight entertainment monitor are installed in a fixed armrest, therefore, seat width is slightly reduced. Floor storage for personal effects is not available for use during takeoff and landing. A bassinet might be installed on the bulkhead for use by a passenger traveling with an infant. 11 D None No Power Seat 11 D is a standard Economy Class seat that has extra legroom and is located at a bulkhead. The proximity to the galley and lavatory area might be bothersome. The tray table and inflight entertainment monitor are installed in a fixed armrest, therefore, seat width is slightly reduced. Floor storage for personal effects is not available for use during takeoff and landing. A bassinet might be installed on the bulkhead for use by a passenger traveling with an infant. 11 F None No Power Seat 11 F is a standard Economy Class seat that has extra legroom and is located at a bulkhead. The proximity to the galley and lavatory area might be bothersome. The tray table and inflight entertainment monitor are installed in a fixed armrest, therefore, seat width is slightly reduced. Floor storage for personal effects is not available for use during takeoff and landing. A bassinet might be installed on the bulkhead for use by a passenger traveling with an infant. 11 H None No Power Seat 11 H is a standard Economy Class seat that has extra legroom and is located at a bulkhead. The proximity to the galley and lavatory area might be bothersome. The tray table and inflight entertainment monitor are installed in a fixed armrest, therefore, seat width is slightly reduced. Floor storage for personal effects is not available for use during takeoff and landing. A bassinet might be installed on the bulkhead for use by a passenger traveling with an infant. 11 J None No Power Seat 11 J is a standard Economy Class seat that has extra legroom and is located at a bulkhead. The proximity to the galley and lavatory area might be bothersome. The tray table and inflight entertainment monitor are installed in a fixed armrest, therefore, seat width is slightly reduced. Floor storage for personal effects is not available for use during takeoff and landing. A bassinet might be installed on the bulkhead for use by a passenger traveling with an infant. 11 K None No Power Seat 11 K is a standard Economy Class seat that has extra legroom and is located at a bulkhead. The proximity to the galley and lavatory area might be bothersome. The tray table and inflight entertainment monitor are installed in a fixed armrest, therefore, seat width is slightly reduced. Floor storage for personal effects is not available for use during takeoff and landing. A bassinet might be installed on the bulkhead for use by a passenger traveling with an infant. 11 L None No Power Seat 11 L is a standard Economy Class seat that has extra legroom and is located at a bulkhead. The proximity to the galley and lavatory area might be bothersome. The tray table and inflight entertainment monitor are installed in a fixed armrest, therefore, seat width is slightly reduced. Floor storage for personal effects is not available for use during takeoff and landing. A bassinet might be installed on the bulkhead for use by a passenger traveling with an infant. 2 A None No Power Seat 2 A is a standard Cloud Nine Business Class seat that transforms into a fully-flat bed. 2 C None No Power Seat 2 C is a standard Cloud Nine Business Class seat that transforms into a fully-flat bed. 2 D None No Power Seat 2 D is a standard Cloud Nine Business Class seat that transforms into a fully-flat bed. 2 H None No Power Seat 2 H is a standard Cloud Nine Business Class seat that transforms into a fully-flat bed. 2 J None No Power Seat 2 J is a standard Cloud Nine Business Class seat that transforms into a fully-flat bed. 2 L None No Power Seat 2 L is a standard Cloud Nine Business Class seat that transforms into a fully-flat bed. 22 A None No Power Seat 22 A is a standard Economy seat that is missing a window. 22 L None No Power Seat 22 L is a standard Economy seat that is missing a window. 26 D None No Power Seat 26 D is an Economy Class seat that may have limited recline due to the bulkhead behind. The proximity to the lavatory area might be bothersome. 26 F None No Power Seat 26 F is an Economy Class seat that may have limited recline due to the bulkhead behind. The proximity to the lavatory area might be bothersome. 26 H None No Power Seat 26 H is an Economy Class seat that may have limited recline due to the bulkhead behind. The proximity to the lavatory area might be bothersome. 26 J None No Power Seat 26 J is a standard Economy Class seat. The proximity to the lavatory area might be bothersome. 27 A None No Power Seat 27 A is a standard Economy Class seat that might have limited recline due to the bulkhead directly behind. The proximity to the lavatory area might be bothersome. 27 B None No Power Seat 27 B is a standard Economy Class seat that might have limited recline due to the bulkhead directly behind. The proximity to the lavatory area might be bothersome. 27 C None No Power Seat 27 C is a standard Economy Class seat that might have limited recline due to the bulkhead directly behind. The proximity to the lavatory area might be bothersome. 27 J None No Power Seat 27 J is a standard Economy Class seat that might have limited recline due to the bulkhead directly behind. The proximity to the lavatory area might be bothersome. 27 K None No Power Seat 27 K is a standard Economy Class seat that might have limited recline due to the bulkhead directly behind. The proximity to the lavatory area might be bothersome. 27 L None No Power Seat 27 L is a standard Economy Class seat that might have limited recline due to the bulkhead directly behind. The proximity to the lavatory area might be bothersome. 28 A None No Power Seat 28 A is a standard Economy Class seat that has extra legroom and is located in an Exit Row. The proximity to the lavatory area might be bothersome. The tray table and inflight entertainment monitor are installed in a fixed armrest, therefore, seat width might be slightly reduced. Floor storage for personal effects is not available for use during takeoff and landing. 28 B None No Power Seat 28 B is a standard Economy Class seat that has extra legroom and is located in an Exit Row. The proximity to the lavatory area might be bothersome. The tray table and inflight entertainment monitor are installed in a fixed armrest, therefore, seat width might be slightly reduced. Floor storage for personal effects is not available for use during takeoff and landing. 28 C None No Power Seat 28 C is a standard Economy Class seat that has extra legroom and is located in an Exit Row. The proximity to the lavatory area might be bothersome. The tray table and inflight entertainment monitor are installed in a fixed armrest, therefore, seat width might be slightly reduced. Floor storage for personal effects is not available for use during takeoff and landing. A bassinet might be installed on the nearby bulkhead, therefore, a passenger traveling with an infant might be seated in the row. 28 D None No Power Seat 28 D is a standard Economy Class seat that has extra legroom and is located at a bulkhead. The proximity to the lavatory area might be bothersome. The tray table and inflight entertainment monitor are installed in a fixed armrest, therefore, seat width is slightly reduced. Floor storage for personal effects is not available for use during takeoff and landing. A bassinet might be installed on the bulkhead for use by a passenger traveling with an infant. 28 F None No Power Seat 28 F is a standard Economy Class seat that has extra legroom and is located at a bulkhead. The proximity to the lavatory area might be bothersome. The tray table and inflight entertainment monitor are installed in a fixed armrest, therefore, seat width is slightly reduced. Floor storage for personal effects is not available for use during takeoff and landing. A bassinet might be installed on the bulkhead for use by a passenger traveling with an infant. 28 H None No Power Seat 28 H is a standard Economy Class seat that has extra legroom and is located at a bulkhead. The proximity to the lavatory area might be bothersome. The tray table and inflight entertainment monitor are installed in a fixed armrest, therefore, seat width is slightly reduced. Floor storage for personal effects is not available for use during takeoff and landing. A bassinet might be installed on the bulkhead for use by a passenger traveling with an infant. 28 J None No Power Seat 28 J is a standard Economy Class seat that has extra legroom and is located in an Exit Row. The proximity to the lavatory area might be bothersome. The tray table and inflight entertainment monitor are installed in a fixed armrest, therefore, seat width might be slightly reduced. Floor storage for personal effects is not available for use during takeoff and landing. A bassinet might be installed on the nearby bulkhead, therefore, a passenger traveling with an infant might be seated in the row. 28 K None No Power Seat 28 K is a standard Economy Class seat that has extra legroom and is located in an Exit Row. The proximity to the lavatory area might be bothersome. The tray table and inflight entertainment monitor are installed in a fixed armrest, therefore, seat width might be slightly reduced. Floor storage for personal effects is not available for use during takeoff and landing. 28 L None No Power Seat 28 L is a standard Economy Class seat that has extra legroom and is located in an Exit Row. The proximity to the lavatory area might be bothersome. The tray table and inflight entertainment monitor are installed in a fixed armrest, therefore, seat width might be slightly reduced. Floor storage for personal effects is not available for use during takeoff and landing. 3 A None No Power Seat 3 A is a standard Cloud Nine Business Class seat that transforms into a fully-flat bed. 3 C None No Power Seat 3 C is a standard Cloud Nine Business Class seat that transforms into a fully-flat bed. 3 D None No Power Seat 3 D is a standard Cloud Nine Business Class seat that transforms into a fully-flat bed. 3 H None No Power Seat 3 H is a standard Cloud Nine Business Class seat that transforms into a fully-flat bed. 3 J None No Power Seat 3 J is a standard Cloud Nine Business Class seat that transforms into a fully-flat bed. 3 L None No Power Seat 3 L is a standard Cloud Nine Business Class seat that transforms into a fully-flat bed. 35 A None No Power Seat 35 A is a standard Economy seat that is missing a window. 35 L None No Power Seat 35 L is a standard Economy seat that is missing a window. 37 A None No Power Seat 37 A is a standard Economy Class seat located in the last row of the plane. Seat back recline might be limited due to the bulkhead behind. The proximity to the galley and lavatory area might be bothersome. 37 B None No Power Seat 37 B is a standard Economy Class seat located in the last row of the plane. Seat back recline might be limited due to the bulkhead behind. The proximity to the galley and lavatory area might be bothersome. 37 C None No Power Seat 37 C is a standard Economy Class seat located in the last row of the plane. Seat back recline might be limited due to the bulkhead behind. The proximity to the galley and lavatory area might be bothersome. 37 J None No Power Seat 37 J is a standard Economy Class seat located in the last row of the plane. Seat back recline might be limited due to the bulkhead behind. The proximity to the galley and lavatory area might be bothersome. 37 K None No Power Seat 37 K is a standard Economy Class seat located in the last row of the plane. Seat back recline might be limited due to the bulkhead behind. The proximity to the galley and lavatory area might be bothersome. 37 L None No Power Seat 37 L is a standard Economy Class seat located in the last row of the plane. Seat back recline might be limited due to the bulkhead behind. The proximity to the galley and lavatory area might be bothersome. 39 D None No Power Seat 39 D is a standard Economy Class seat located in the last row of the plane. Seat back recline might be limited due to the bulkhead behind. The proximity to the galley and lavatory area might be bothersome. 39 F None No Power Seat 39 F is a standard Economy Class seat located in the last row of the plane. Seat back recline might be limited due to the bulkhead behind. The proximity to the galley and lavatory area might be bothersome. 39 H None No Power Seat 39 H is a standard Economy Class seat located in the last row of the plane. Seat back recline might be limited due to the bulkhead behind. The proximity to the galley and lavatory area might be bothersome. 4 A None No Power Seat 4 A is a standard Cloud Nine Business Class seat that transforms into a fully-flat bed. The proximity to the galley and lavatory area might be bothersome. 4 C None No Power Seat 4 C is a standard Cloud Nine Business Class seat that transforms into a fully-flat bed. The proximity to the galley and lavatory area might be bothersome. 4 D None No Power Seat 4 D is a standard Cloud Nine Business Class seat that transforms into a fully-flat bed. The proximity to the galley and lavatory area might be bothersome. 4 H None No Power Seat 4 H is a standard Cloud Nine Business Class seat that transforms into a fully-flat bed. The proximity to the galley and lavatory area might be bothersome. 4 J None No Power Seat 4 J is a standard Cloud Nine Business Class seat that transforms into a fully-flat bed. The proximity to the galley and lavatory area might be bothersome. 4 L None No Power Seat 4 L is a standard Cloud Nine Business Class seat that transforms into a fully-flat bed. The proximity to the galley and lavatory area might be bothersome. 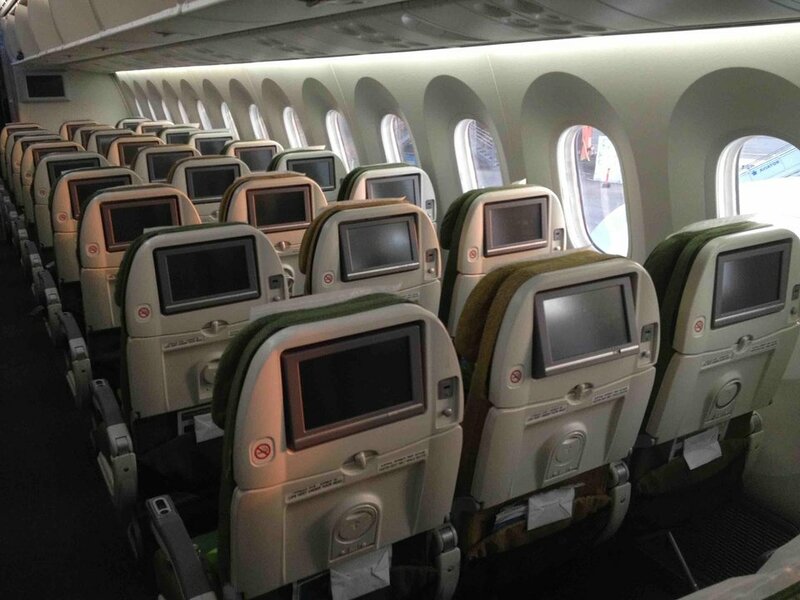 Video on the Ethiopian Airlines Boeing 787-8 is provided through personal inflight entertainment monitors at every seat. A variety of films, television shows, documentaries, short topic presentations, and a map detailing inflight progress are displayed. AC 110v power ports/sockets are available for passengers seated in Cloud Nine Business Class and Economy Class. USB power ports are available at every seat. Ethiopian Airlines Boeing 787-8 widebody aircraft operate on long-haul routes. 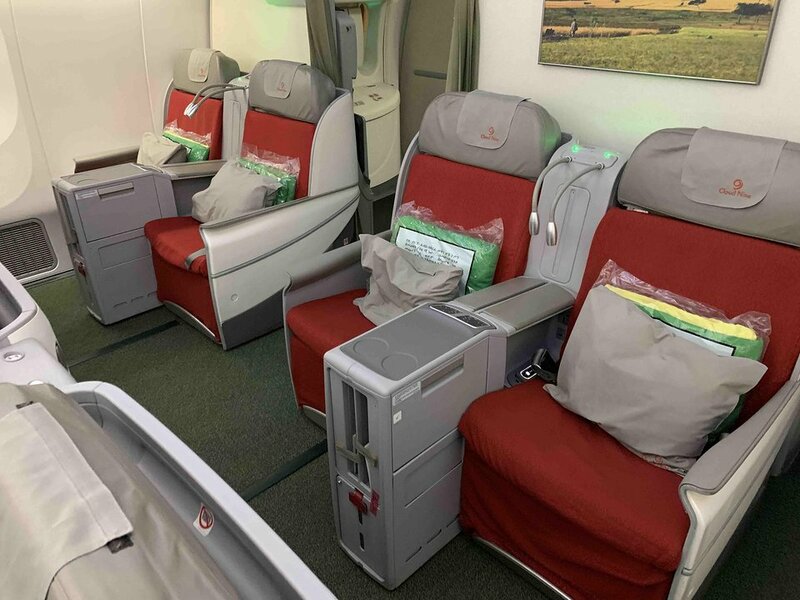 Ethiopian Airlines has configured their widebody with Cloud Nine Business Class and Economy Class. 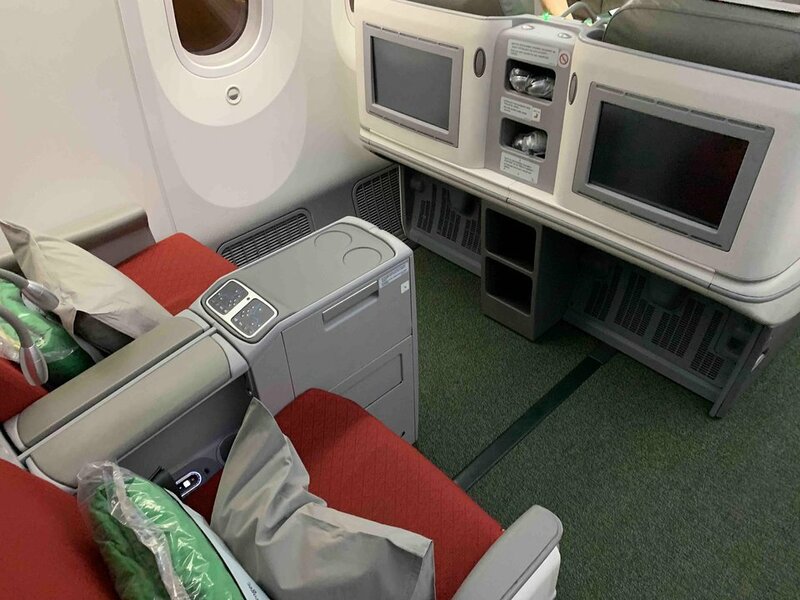 Cloud Nine seats transform into fully-flat beds for comfort on overnight flights. 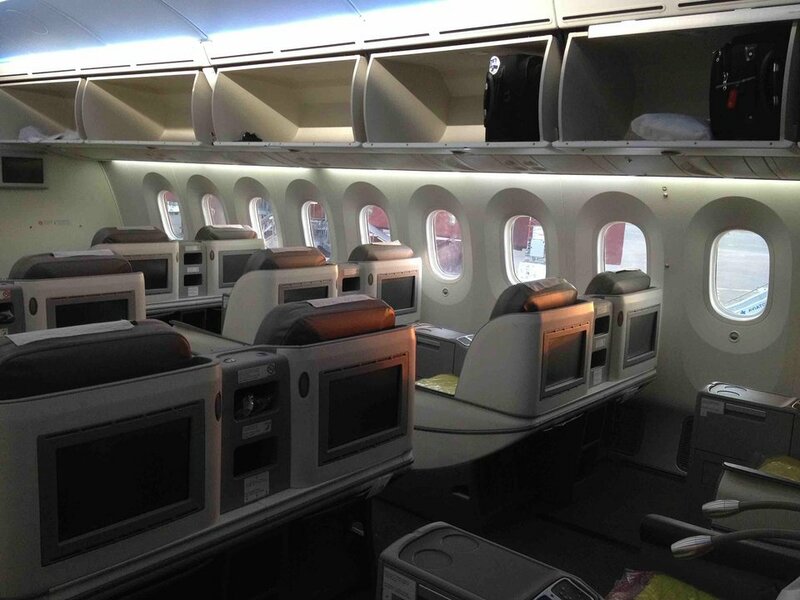 Entertainment onboard is provided via personal monitors in Cloud Nine and individual seat back monitors in Economy. Excellent seats - 3 of us travelled Dublin to LAX, seats were huge, reclined more than enough to sleep. TVs are huge and the inflight entertainment system had more than enough new films to keep you occupied. Food was great and the cabin crew could not do enough to help you. Food is mixed, the Ethiopian food is fantastic, the wines very good, the breads and pastries and deserts all great, the main course was disappointing but we'd enough food on the Ethiopian main dish. Cloud 9 is worth every cent of the fares which are extremely competitive. Conviction buy. Great leg space, flights from Addis are usually overnight, so people don't use toilets that much. 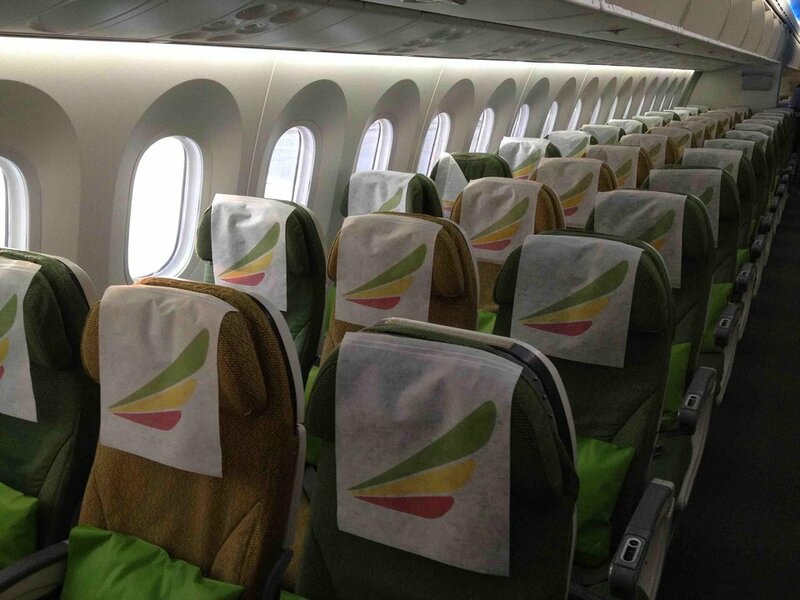 However be warned that not all Ethiopian 787 have same seatmap. I had the same seat (28B) on the flight from Addis and on return (both to and from Rome). On flight to Addis emergency row was 30! On flight back it was 28! Not sure how to distinguish which plane has which configuration. I booked those seats in advanced at Eth Airlines office in Addis and were told that both are at emergency exit. This seat was a little more cramped than others I have sat on this plane. It seemed like the legroom was smaller than others and I found it difficult to put my legs under the seat in front of me. Flew Dublin Addis on 15 Nov 2015 seat 2L was broken and didn't recline. On return leg on Nov 20, same seat hadn't been repaired and was still broken. Best not to choose this seat until someone cN confirm it's been fixed. Very disappointed that ET did not install lie-flat seats in Business on their newest aircraft.Their B777's have them and are much more comfortable. Avoid bulkhead seats on the 787 at all costs. The check-in agent recommended me to choose this seat due to the additional legroom. However: - What was not mentioned was that all of the bulkhead seats were occupied by various babies and young children who screamed and cried most of the 12 hours from DC to Addis. - If you consider that 787 seats are already very narrow, the space taken by the TV and table in the armrest makes it intolerable for a long flight. Ethiopian actually has quite good legroom on normal seats on its long haul flights, so much better off to choose one of them. This seat has extra leg room, but be warned that the aisle shifts significantly over from the bathroom so flight attendants who aren't extra careful can easily ram your legs straight on. Ethiopian Airlines flies 1 versions of Boeing 787-8 (788).